Buying a inflatable obstacles for paintball battlefield from PanGo Inflatables, you make an absolutely great choice. You will find that an inflatable product such as the paint ball has the ability to change the entire atmosphere of a function, no matter the occasion thereof. You might consider it strange that there even exists something such as an inflatable obstacles paintball. 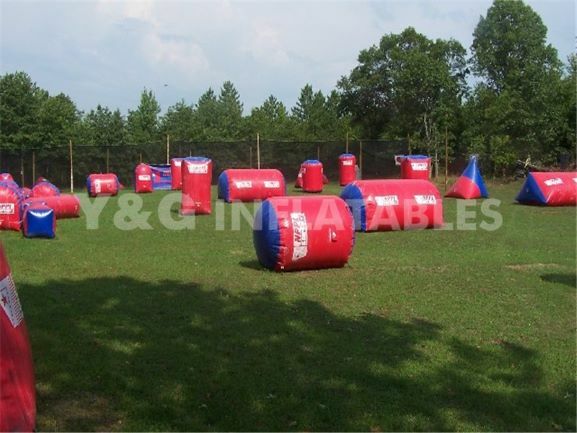 However, we at PanGo Inflatables realized the popularity of inflatable paintball as a social activity and subsequently decided that it would be much easier for you if we can bring a paint ball battlefield to you, rather than you and your guests having to travel to a traditional paint ball battlefield. While you still need to find a suitable area where the inflatable obstacles paintball battlefield can be inflated and set up, you do not have to go through nearly as much trouble as is the case when playing at a traditional paint ball battlefield. PanGo Inflatables subsequently facilitates your life a lot with regards to the organization of your function seeing as we do the complete set-up on your behalf. You can thus mingle with your guests and share in the pre-excitement of the occasion while our competent staff is busy with the set-up. If your guests lead an active lifestyle and share your passion for inflatable obstacles for paintball, they will enjoy the inflatable obstacles paintball battlefield even more, while those who will participate in paint ball for the first time will remember it with fondness. Chances are that your guests will talk about their experiences on the inflatable obstacles paintball battlefield long after your function has ended. You should feel free to organize other activities around the inflatable obstacles paintball battlefield if you like; however, no matter what else there is to do, the inflatable obstacles paintball battlefield will undoubtedly be the highlight of the event. Thus next time you are pondering about ideas for a particular function, do not hesitate to contact PanGo Inflatables to buy your own inflatable obstacles for paintball .